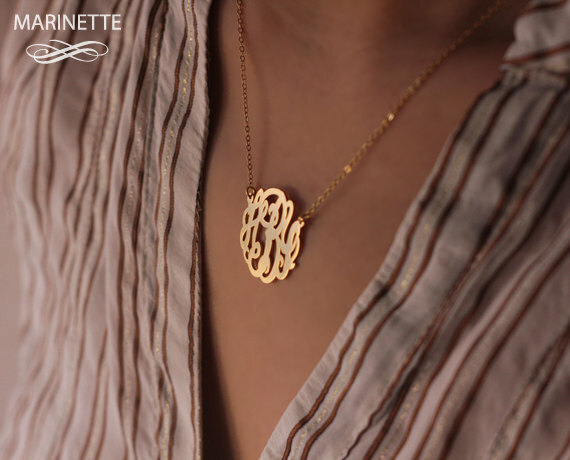 Something Delightful : Marinette Jewelry Monogram Giveaway! I loooove the gold necklace... Anything in yellow gold is right up my alley! I'd wear it constantly! I love the gold necklace! You can wear it with anything. I LOVE the gold! I would literally wear it everywhere! Thank you for such a great giveaway, Rachel! the gold is gorgeous! Definitely great for work, school, AND going out! 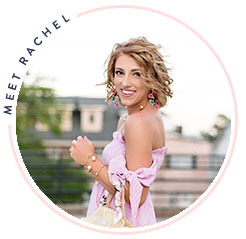 Love keeping up with your blog, Rachel! I love the gold bracelet, I'd wear it everyday. I love the gold or silver monogram necklace! I'd wear it with literally every outfit :) I think it's a wonderful classic piece! I love the simple gold monogram necklace! Id wear it all the time. Including with my scrubs! I like the one inch monogram necklace in gold. 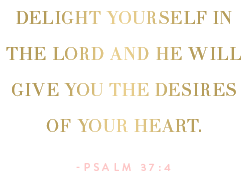 Whenever I wear gold jewelry, I love pairing it with my gold Jack Rogers! I love the simple gold necklace! I already have a silver one so it would be great to alternate! Thank you for introducing me to this great etsy shop, Sister! I love all of the items they carry, especially the monogram pearl bracelet. It is so fun and different -- would be the perfect addition to my daily stack! I am a HUGE supporter of Marinette Jewelry. I got my monogrammed necklace from there and get SO many compliments! So, if I won I would choose the monogram bracelet and wear it with my every day stack! :) I love a good monogram!! Thanks for the great giveaway..crossing my fingers that I'll win! Such a great giveaway!! I've been dying for a monogrammed necklace! If I won, I'd choose the gold necklace and I know I'd wear it 24/7! I really love the gold monogrammed bracelet and I'm sure I would wear it just all the time in my bracelet stacks! It's perfect! I love the bracelet in silver. Would look super cute as a daily bracelet! 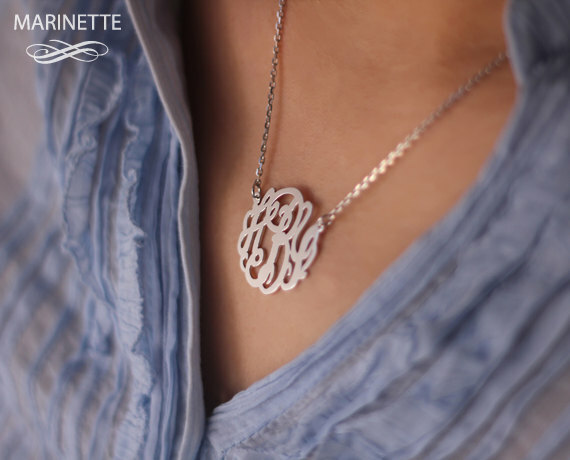 I love the 1.5 inch silver monogram necklace! It's my favorite! Thanks for the opportunity! The bracelet in gold would be perfect paired with my Michael Kors watch! So pretty! I hope I win :) Happy Friday! The gold necklace is beautiful, and so versatile! It could be worn with jeans and a tee, or dressed up with a sleek LBD! 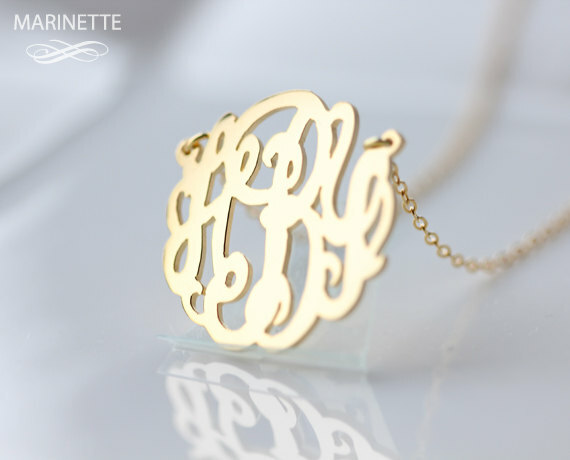 I would love to wear the gold monogram necklace with just about anything! It's so versatile. I have been dying to buy a gold monogrammed necklace for awhile now! This is some of the best prices I've seen! It would definitely be an everyday wear, I love how they look with other necklaces layered. I love the silver necklace. I'd wear it with everything! I have been wanting one of these necklaces for so long! I love the pearl beaded monogram bracelet best of all. She has such lovely things! It would absolutely be an everyday wear kind of thing, probably stacked with my pearl bracelet (I always wear one) and a cute bangle or two! I would love to win a gold one! It's beautiful! I love the 1.5 inch monogram necklace. The silver would match the earrings/watch I always wear but the gold is pretty too! I love the gold monogrammed necklace...where WOULDN'T I wear it?? 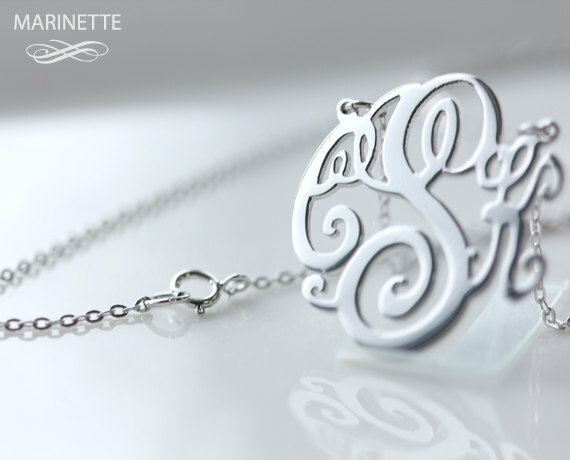 Check out this silver monogrammed necklace! It's super cute and pretty affordable! Those are some great looking Monogram Necklace. Thank you for sharing this with us Eileen. My wife was just mentioning to me how she would love to have one of these, so I'm going to make sure I share your blog with her. Thanks again! Hi, I love your style and blog very much! Recently i bought a personalized necklace from GetPersonalizedJewelry, the style is very beautiful with high quality. I think you might like it. I think you might like it because it fits your outfit and style!